I’ve done a reworking of much of my personal online content. This system uses MordPress Multi-Site, where I can manage most of my blogs as one installation, though most people will not be able to tell thanks to Domain Mapping. Anyway, this general blog is just a portal to my personal and other blogs, most of which will publish to social media as posts happen. And they will happen! 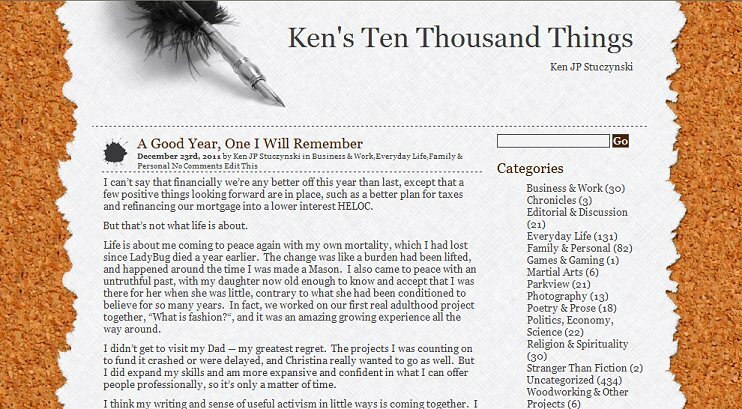 This is where I will post what is going on with various (mostly online) projects, in contrast to my personal journal, “Ken’s Ten Thousand Things”. For now, I’m gearing up for a new blog on Freemasonry, converting BuffaloTaiChi.com into a martial arts blog with instructional vids, and maybe some other video-related projects. NickelCity.Net will become another Multi-Site install and I may make available blogs to local community organizations at little or no cost. Plans for GeeksBearingGifts.Com are still in brainstorming mode, but will probably be a BuddyPress site for geek-related content, technology consumer information, and maybe reviews or even sales. There’s a lot more, but it will have to be developed more before a reveal. Ken, 14 January, 2012. Category: Uncategorized.